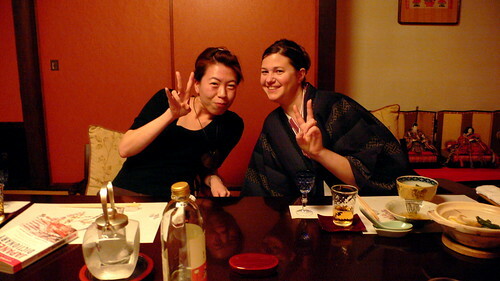 My friend Hiromi, a plastic surgeon who lives in Kurashiki, joined Lea and I for dinner after she was finished with her work. Ryokan generally serve local specialties in the kaiseki style, which is a bit like ‘haute cuisine’ in the sense that incredible attention is paid to quality of ingredients, presentation, and the continuous and neverending appearance of one dish after the other. Since Lea is a vegetarian I had to call ahead to request a vegetarian meal and they did an incredible job of matching the ‘meated’ kaiseki meal with an elegant vegetarian version. There was really so much food that it’s pointless to try to give a marching account, but it was all incredibly delicious. The food was served with a local sake that arrived bearing a label decorated in hina dolls. We drank the sake out of a special pot that was something like a glass teapot except instead of having tea in the center there was ice to cool the sake down to its proper temperature. Sadly Hiromi, who was going to show us around Kurashiki on Sunday, had to bow out of tourguide duty in order to perform an unexpected Sunday morning jaw reconstruction.